Single-channel, 100-watt head boasts valve-driven reverb and tremolo. 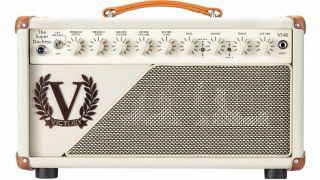 NAMM 2019: Victory Amplification has announced the V140 The Super Duchess, a 100-watt, single-channel all-tube head with valve-driven reverb and tremolo. The new amp is based on the company’s popular Heritage Series V40 Deluxe, only fortified with an additional pair of 6L6 power tubes and a bigger transformer that delivers, the company says, “more depth, more clarity and definition." Features of the V140 include four 12AX7 and four 6L6 tubes; a long-tank, valve-driven spring reverb; an additional, newly voiced Mid Kick switch option that adds more upper midrange focus and cut, high (100 watt) and low (30 watt) power and an exterior finished in cream vinyl. The V140 The Super Dutchess is being offered for $1,829. For more information, head over to Victory Amps.